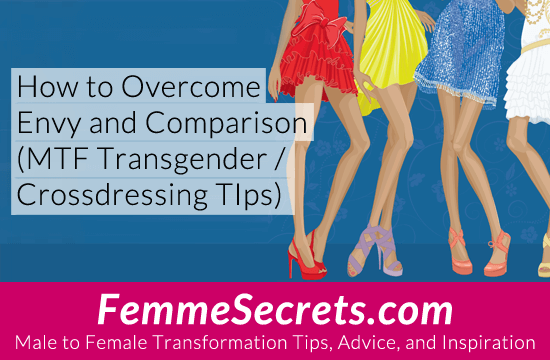 Do you ever compare yourself to cisgender women? 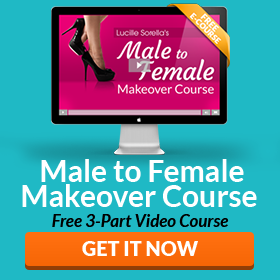 Or girls who are further along on their feminine journeys? Have you ever looked at somebody else’s life or looks and thought… why can’t I have that? It’s only human to feel jealous or envious from time to time. But it sure doesn’t feel good! And it can keep you from reaching your own goals. So how can you deal with these feelings? Read on to discover 5 ways to overcome envy and comparison. Most people show an idealized version of themselves online. The photos you’re looking at might be Photoshopped or use flattering filters. Not that there’s anything wrong with that, just know they’re not a reflection of somebody’s 24/7 reality. You have no idea what’s happening behind the scenes. Everybody has problems and struggles, and for all you know, they might be dealing with their own feelings of insecurity. Remember that the next time you scroll through social media! When we envy somebody, it’s a sign that they have something we want for ourselves. That in itself isn’t a bad thing. Instead of letting somebody else’s good looks or success make you feel bad, let it inspire you to reach for the same. Set a realistic goal and channel your energy towards achieving it. Taking positive action feels amazing, so this can be a great way to turn things around. This might sound harsh, but I say it with love. If you find yourself spending a lot of time sitting around and comparing yourself to others, it’s easy to get caught in negative thought loops. Quite simply, you need to spend less time in your head and more time out living your fabulous life! If you’re busy having fun, making friends, and exploring new activities, there’s no time to obsess about others. Problem solved! Are you surrounded by people who constantly complain about how unfair life is? Or who are always trying to outdo each other like a bunch of teenage girls? Those thought patterns are contagious, so the best thing you can do is find better people to be around: People who are happy, positive, and grateful. I realize there are people you can’t cut out completely (like family), but look for positive outlets. Explore Meetup groups, support groups, or positive forums or Facebook groups. The best way to overcome envy is to shift the focus back to yourself and everything that makes YOU special, unique, and beautiful. It’s not like there’s a limited supply of beauty or success out there, so keep reminding yourself of your own strengths and attributes. Is this trite advice? Maybe. Does it work? ABSOLUTELY. How do YOU deal with envy and comparison? It’s normal to feel jealous or envious from time to time. But the sooner you get over it and put the focus back on your own life and goals, the better! Because the truth is, girlfriend, YOU are amazing! As always, I’d love to hear your thoughts. Have you ever struggled with comparison or envy? If so, how did you deal with it? Thank you Lucille for time you take to make this a success. It has been only a couple months that I haven’t felt inferior in my walk.